Objective. To validate in a general patient population (GPP) the clinical value of measuring rheumatoid factor (RF) isotypes in relationship to IgG anti-cyclic citrullinated peptide (CCP) antibodies (CCP2 and CCP3). Methods. Serum samples were obtained as follows: 1021 GPP, for whom RF was ordered for diagnosis, 137 with rheumatoid arthritis (RA), 100 healthy blood donors (HBD), and 50 with systemic lupus erythematosus. Turbidimetry and ELISA were utilized for RF screening, and individual RF isotypes and IgG anti-CCP antibodies were measured by ELISA; RF IgG was measured after pepsin digestion. Results. We validated the generally accepted 90%–98% positive predictive value (PPV) and about 68% sensitivity of the anti-CCP2 test on our diagnosed cohorts as 96% (95% CI 89–99) and 65% (95% CI 56–73), respectively. The 282 RF IgM+ specimens identified in the GPP were subdivided into 3 subsets: (1) 83 as RF IgM+ IgG+ IgA+ with 63% (95% CI 51–73) anti-CCP2+ (i.e., sensitivity similar to the RA cohort); (2) 50 as RF IgM+ IgG− IgA+ with significantly fewer anti-CCP2+ (22%; 95% CI 12–36); and (3) about half as IgM+ IgG− IgA− with just 3% (95% CI 1–8) anti-CCP2+, i.e., not significantly different from the 1% (95% CI 0–5) in HBD. Thus, the chance for a specimen in the GPP to be anti-CCP2+ (i.e., to come from an RA patient) was increased by 7- and 21-fold, respectively, by identifying RF IgA and IgG in addition to IgM. About one-third of anti-CCP− RA patients in our cohort were RF IgM+ IgG+ IgA+, reflected as 3.4% in the anti-CCP2− GPP. The agreement between anti-CCP2 and anti-CCP3 was significantly higher for RF+ RA and GPP patients, 86% (95% CI 78–93) and 83% (95% CI 73–91), respectively, than for the RF− RA (27%; 95% CI 6–61), RF− GPP (4%; 95% CI 0–19), and non-RA controls. Anti-CCP2 but not anti-CCP3 significantly distinguished the HBD from the GPP (95% CI). Conclusion. Measurement of the 3 isotypes of RF may increase by 7- to 21-fold the chance of making the serologic diagnosis of RA; a testing algorithm is proposed. The anti-CCP antibody response appears significantly less peptide-specific in the presence of IgM RF than in its absence. The classical rheumatoid factor (RF) was initially detected in clinical laboratories as an IgM antibody that agglutinated sheep erythrocytes coated with rabbit IgG or latex particles coated with human IgG. Subsequently, the latex agglutination assay has been automated using turbidimetry, which has become the most widely used RF assay method1. The sensitivity for rheumatoid arthritis (RA) of RF IgM has been shown to range from 55% to 90%, with a positive predictive value (PPV) of about 30%, which is certainly not optimal1,2,3,4,5. The introduction of solid-phase immunoassays has permitted separate measurement of IgM, IgG, and IgA RF isotypes. The availability of IgG and IgA RF assays has significantly improved the diagnostic specificity of the test compared to latex agglutination and turbidimetry5,6,7. Moreover, the occurrence of RF IgA together with RF IgM was reported to precede the development of RA by several years8,9. RF IgG, when measured as F(ab’)2 after pepsin digestion, has been shown to have a high specificity for RA5,10. As a result, in the process of routine diagnosis the presence of all 3 isotyopes of RF yielded a sensitivity, specificity, and PPV of 53%, 99%, and 96%, respectively5. Recently, the presence of antibodies to natural citrullinated proteins, such as filaggrin11, vimentin12, and fibrinogen13, etc., have been shown to have high specificity and PPV for RA, far superior to that of RF IgM measured by turbidimetry. The most widely used IgG anti-cyclic citrullinated peptide assay is the second generation (CCP2) ELISA. A recent extensive metaanalysis of reports on this test showed an overall sensitivity for RA of 68% with a specificity > 95%14 and PPV 90%–98%15. Unlike the classic RF IgM, anti-CCP2 is present in < 5% of patients with non-RA collagen vascular disease including systemic lupus erythematosus (SLE) and primary Sjögren’s syndrome16 or viral hepatitis17,18. It has also been well documented and widely reported that about one-third of RF− RA patients are anti-CCP2+19. Recently, another synthetic citrullinated peptide, CCP3, has been utilized as antigen in a third-generation assay and has been shown to have similar sensitivity and specificity to CCP2 for RA20,21,22. However, the relationships among anti-CCP2, anti-CCP3, and rheumatoid factors has not yet been investigated. Early aggressive treatment of RA has been shown to have significant advantages for overall outcome23. Thus, the use of a combination of serologic tests could play a significant role in early diagnosis and treatment of RA patients, especially in the presence of an ambiguous clinical presentation. The combination of RF IgM and IgA plus IgG anti-CCP2 has been proposed to have a PPV close to 100%24. We tested the sensitivity and PPV of anti-CCP2 for RA and used these parameters as “markers” for patient groups selected on the basis of the presence of one or more of the RF isotypes. Consecutive serum samples from 1021 patients for whom routine RF testing was requested from ARUP Laboratories, Salt Lake City, Utah, were used, representing the general patient population (GPP). The RA study population consisted of 137 clinically diagnosed patients that met the American College of Rheumatology (ACR) criteria for RA25. The first control population included 100 healthy blood donors (HBD): 49 men (ages 16–70 yrs, mean 34) and 51 women (ages 16–54 yrs, mean 32). The second included 50 patients with SLE, who met the ACR diagnostic criteria26. The SLE control group included patients at various stages of disease, i.e., without consideration for treatment or disease activity, from a cohort of 114 patients, as described27. Of the 114 patients, 68% were black, 19% Hispanic, and 13% white; 95% were women and 5% men. The mean duration of disease was 8.6 years (range 1 month to 45 years). The specimens used for this study were picked randomly. The only condition was to have the definitive diagnosis of SLE and to have had multiple autoantibodies at the time of collection, including anti-dsDNA. All patient samples were deidentified according to the University of Utah institutional review board approved protocol 7275 to meet the Health Information Portability and Accountability Act (HIPAA) patient confidentiality guidelines. Routine RF screening of the GPP was performed using RF II Tina-quant® Turbidimetry reagents (Roche Diagnostics, Indianapolis, IN, USA). The RF II assay measures RF in human serum using heat-inactivated human IgG bound to latex particles (via Roche/Hitachi auto-analyzer) and does not differentiate between RF isotypes. This assay is performed routinely at ARUP Laboratories as stated in the product insert. The specificity of this assay was 97% based on our HBD cohort. Second- and third-generation assays for anti-cyclic citrullinated peptide (Quanta Lite™ CCP IgG ELISA and Quanta Lite™ CCP3 IgG ELISA; Inova Diagnostics, San Diego, CA, USA) were performed according to the manufacturer’s product insert. To minimize bias, the tests for anti-CCP and the tests for RF isotypes for the GPP were done at separate institutions, blinded from each other’s results. Statistical analysis was performed using Microsoft Excel data processing software. Linear correlation was used to assess the relationship between IgG anti-CCP2 and anti-CCP3, and p values < 0.05 were considered significant. Among the cohort of 137 RA patients, 80% (95% CI 72–86) were RF+ (Table 1, Figure 1). The distribution of RF isotypes among the RF+ RA patients showed that the largest subset was RF IgM+ IgG+ IgA+ (n = 60), followed by RF IgM+ IgG− IgA+ (n = 30), and RF IgM+ IgG− IgA− (n = 17); only 1 patient was RF IgM− IgG− IgA+ and 1 was RF IgM− IgG+ IgA+. Rheumatoid factor isotypes in the RA population (N = 137). Prevalence of IgG anti-CCP2 and anti-CCP3 in different populations. Among the RA patients, 65% (95% CI 56–73) were anti-CCP2+ (Table 1). There were more anti-CCP2+ specimens among the RF+ subset of RA (76%; 95% CI 67–84), but this did not achieve significance (Table 1); the proportion of anti-CCP2+ among RF− RA patients was significantly lower (18%; 95% CI 6–37). The HBD and SLE control groups had 1% (95% CI 0–5) and 6% (95% CI 1–17) anti-CCP2+, respectively. The calculated PPV for RA of the anti-CCP2, based on our cohorts of characterized patients and controls, was 96% (95% CI 89–99). 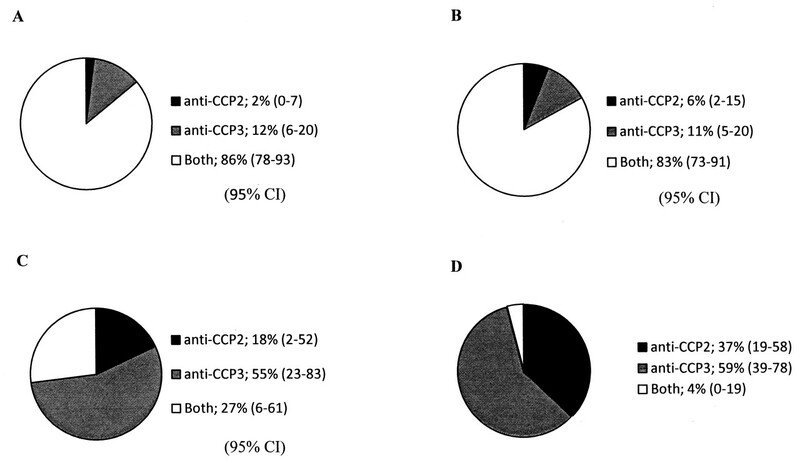 Among the 1021 GPP specimens, 218 were RF+ by turbidimetry, of which 33% (95% CI 27–40) were anti-CCP2+ (Table 1). By ELISA, there were 282 IgM+ RF specimens (Table 1), of which 24% (95% CI 20–30) were anti-CCP2+ (Table 1). These IgM+ RF specimens, however, could be subdivided into 3 major subsets (Figure 2) that showed a strong relationship between RF isotypes and anti-CCP2: (1) 83 that were RF IgM+ IgG+ IgA+, of which 63% (95% CI 51–73) were anti-CCP2+; (2) 50 RF IgM+ IgG− IgA+, with significantly fewer anti-CCP2+ (22%; 95% CI 12–36); (3) 139 RF IgM+ IgG− IgA− (about 50% of all RF+ specimens), with only 3% (95% CI 1–8) being anti-CCP2+. This last subset was similar to our cohort of HBD with 1% anti-CCP2+ (95% CI 0–5). There was a small subset of 10 specimens that were RF IgM+ IgG+ IgA−, of which only 1 was anti-CCP2+ (data not shown). Thus, in the RF+ population, the probability for a specimen in the GPP to be anti-CCP2+ was related to the presence of IgG and IgA RF in addition to IgM RF. Stated numerically, from having IgM RF only, the chance for a specimen to be anti-CCP2+ increased by 7-fold and 21-fold, respectively, if IgA and IgA+ IgG RF were also present. Presence of IgG anti-CCP2 as a function of RF isotypes in the general patient population (GGP). We also examined the presence of RF isotypes among the anti-CCP2− patients with RA. 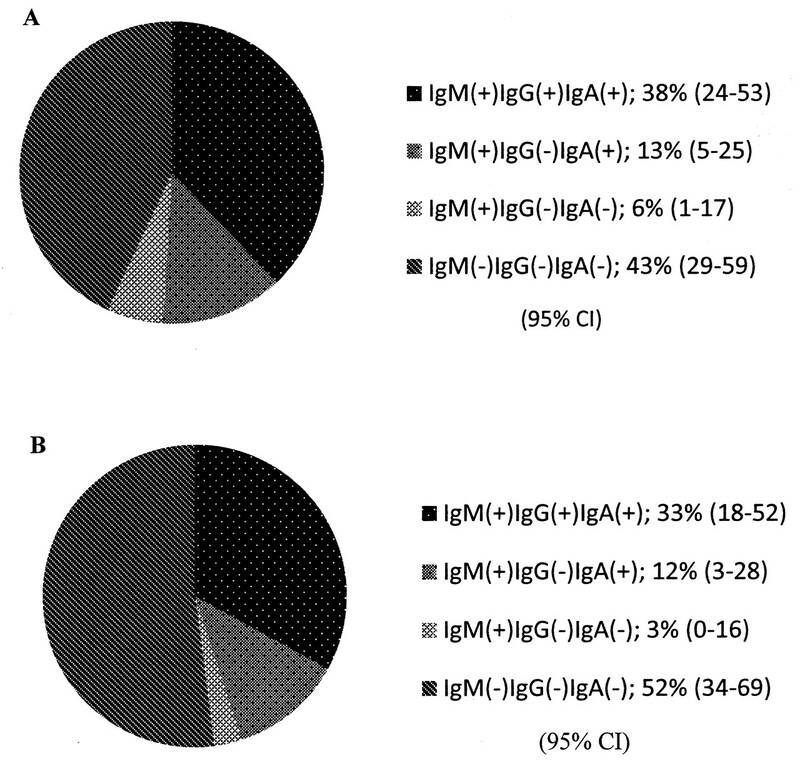 Over half were RF+, and 38% (95% CI 24–53) were RF IgM+ IgG+ IgA+ (Figure 3). Similar proportions were found in anti-CCP3− RA patients (Figure 3). 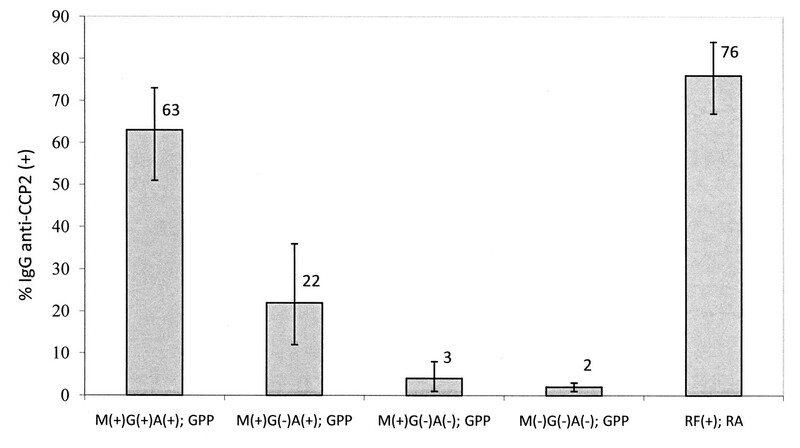 This distribution may have some bearing on the 941 anti-CCP2− GPP cohort: 32 (3.4%) were RF IgM+ IgG+ IgA+, 37 (3.9%) were IgM+ IgG− IgA+, 10 (1%) were IgM+ IgG+ IgA−, and 102 (11%) were IgM+ IgG− IgA−. Rheumatoid factor isotypes among (A) IgG anti-CCP2− (N = 48) and (B) IgG anti-CCP3− sera (N = 35) from 137 RA patients. There was no significant difference in the prevalence of the 2 anti-CCP antibodies when the entire cohort of 1021 GPP specimens was considered (Table 1), although a slightly higher percentage of specimens were anti-CCP3+. For this GPP, for whom the RF was ordered in the process of diagnosis, 7.7% (95% CI 6–10) were anti-CCP2+, significantly different from 1% (95% CI 0–5) in the HBD cohort (Table 1). There was no significant difference for anti-CCP3+ between the GPP and HBD cohorts [i.e., 8.4% (95% CI 7–10) vs 3% (95% CI 1–9), respectively; Table 1], suggesting a comparatively lower specificity for anti-CCP3. For all specimens identified as positive by both anti-CCP2 and anti-CCP3, there was a good linear correlation between the levels obtained by the 2 tests (R = 0.723, p < 0.001; data not shown). When the 2 anti-CCP tests were compared in RF+ and RF− patients, there was a clear difference in the proportion of positive specimens. Of the 137 RA patients, 106 were positive by one or both anti-CCP antibody specificity tests. In RF+ RA, 86% (95% CI 78–93) were anti-CCP2+ CCP3+, 2% were anti-CCP2+ CCP3−, and 12% were anti-CCP3+ only (Figure 4). These findings were very similar to RF+ specimens in the GPP (Figure 4). There was significantly lower agreement, however, between the 2 anti-CCP tests for RF− RA and RF− GPP specimens (Figure 4). Moreover, compared to RF+ RA [86% (95% CI 78–93)] a significantly poor agreement was detected in the control group (SLE and HBD): 9% (95% CI 0–41; data not shown). Thus, anti-CCP2 and anti-CCP3 tests identified largely the same patients when they were RF+ and largely different populations in the absence RF or in non-RA patients. Relationship between IgG anti-CCP2 and anti-CCP3 in (A) RF+ RA, (B) RF+ general patient population (GGP), (C) RF− RA, and (D) RF− GPP. In addition to IgM RF, we observed that there is a significant relationship between the presence of IgG and IgA RF isotypes and IgG anti-CCP antibodies in the likelihood of making a diagnosis of RA. It ranged from indifferent for RF IgM+ IgG− IgA− to low probability for RF IgM+ IgG− IgA+, to very likely for RF IgM+ IgG+ IgA+ patients. In addition, it appears that the presence of RF is associated with a broad anti-CCP antibody response. For the purpose of our study, since the actual clinical diagnosis of patients in the GPP was not available, we used as a surrogate the expected 68% sensitivity, > 95% specificity, and 90%–98% PPV for RA of IgG anti-CCP214,15,19. Indeed, these well established features of anti-CCP2 were also seen in our cohort of clinically characterized patients (i.e., 65% of all RA patients and 76% of the RF+ RA subset were anti-CCP2+); and only 1% and 6% of HBD and SLE patients, respectively, were anti-CCP2+, with an overall PPV of 96%. Based on this premise, 63% of RF IgM+ IgG+ IgA+ specimens in the GPP were also anti-CCP2+, indicating that this subset of the GPP was very similar to the RA cohort. This observation is in strong agreement with the 99% specificity and 96% PPV for RF IgM+ IgG+ IgA+ previously described in a clinically characterized patient population when RA patients were compared to patients with other rheumatic diseases5. Turbidimetry, used routinely in clinical laboratories, does not distinguish between RF isotypes. Here, only 33% (95% CI 27–40) of the RF+ GPP were anti-CCP2+ or anti-CCP3+, i.e., in the absence of clinical data the presence of RA had a low probability. However, as shown here, the IgM+ RF cohort of the GPP is composed of at least 3 distinct subsets with significantly different ability to predict RA, as follows: (1) The frequency of anti-CCP2+ specimens in the RF IgM+ IgG− IgA− subset (plus a few RF IgM+ IgG+ IgA−) was indistinguishable from the frequency in the RF− subset. This suggests that a specimen having only IgM RF is associated with low probability of RA, as also shown previously on defined patient populations1,2,3,4,5. (2) The frequency of anti-CCP2+ was higher in the RF IgM+ IgG− IgA+ subset, i.e., the patients were more likely to have RA. (3) The frequency of anti-CCP2+ in the RF IgM+ IgG+ IgA+ subset was very similar to that in the RA patients, i.e., the patients were very likely to have RA; this is in agreement with the 96% PPV for patients who were RF IgM+ IgG+ IgA+ in a hospital population with defined diagnoses5. Specific measurement of RF IgG, however, requires pepsin digestion as done in our study. Without digestion, the specificity of IgG RF, and as a result of having all 3 isotypes correctly measured, is much lower19,28,29. This is likely due to nonspecific interaction between IgG on the solid phase and IgG in the patient’s serum5,6,10. Thus, the clinician places a completely different emphasis on the RF test results for making the diagnosis if the isotype composition is known, which may be particularly valuable for early diagnosis or when the presentation is ambiguous, an aspect that deserves further support. It is particularly useful when the patient is anti-CCP− (Figure 3). At this time it is difficult to interpret the additional value provided by anti-CCP3, except that it is most likely equivalent to anti-CCP2 in terms of overall sensitivity and specificity for RA20,21,22. In our study, the difference in sensitivity and specificity between the 2 tests was not statistically significant, although consistently more specimens were anti-CCP3+ than anti-CCP2+ (Table 1) in both the RA and control groups. However, the specificity was significantly lower for anti-CCP3 when the entire GPP was compared to the HBD (Table 1). Considering that the GPP was likely to contain a significant number of patients with RA, anti-CCP2 (7.7%; 95% CI 6–10) was able to distinguish it from the HBD cohort (1%; 95% CI 0–5), whereas anti-CCP3 (8.4%; 95% CI 7–10 vs 3%; 95% CI 1–9) could not. The potential added value of the anti-CCP3 test may be derived from a further examination of specimens from RF− RA patients and non-RA cohorts. Anti-CCP2 has been shown to be positive in 35%–40% of RF− RA patients19, similar to data in our cohort (18%; 95% CI 16–37). Unlike RF+ RA and RF+ GPP specimens, where the agreement between anti-CCP2 and anti-CCP3 was very high (83%–86%), there was a significantly lower agreement for the RF− subset of RA (18%) and the GPP (37%; Figure 4), and also in the non-RA patients and HBD. We propose that the presence of RF is associated with a relatively broad anti-CCP antibody response, which results in a large overlap between the presence of anti-CCP2 and anti-CCP3 in the same specimen. In the absence of RF, the response was relatively narrow, i.e., the patients developed either anti-CCP2 or anti-CCP3 or only anti-CCP3. Thus, our results suggest that careful examination of more clinically diagnosed RF− RA patients is needed to determine to what degree anti-CCP3 identifies RA in addition to the 35%–40% identified by anti-CCP219. This observation raises the possibility of having specific serological markers for all RA patients if appropriate citrullinated peptides are identified, but at the potential cost of reducing diagnostic specificity. RF+ RA is significantly more severe and has worse outcome than RF− RA. Thus, appropriate identification of RF+ patients in the screening process is essential. It has been shown that ELISA is significantly more sensitive than turbidimetry in detecting RF IgM6. Indeed, at the same level of specificity, 97%, we identified 282 RF+ specimens by ELISA and 218 by turbidimetry (Table 1). Moreover, rabbit IgG (the antigen utilized in this ELISA) is known to offer better specificity for RA than human IgG used in turbidimetry30. Routine screening with a high sensitivity RF IgM ELISA and anti-CCP tests31,32, followed by isotype determination5,8,33, may lead to early diagnosis of RA even before the onset of clinical symptoms. For those very likely to have or develop RA, early diagnosis may change the outcome and may drastically reduce the cost of treatment23,34. Based on the data presented here and previously5,8,10,14,15,19,31,32,33, an algorithm is proposed for the most efficient use of RF test by ELISA in the diagnosis of RA (Figure 5). 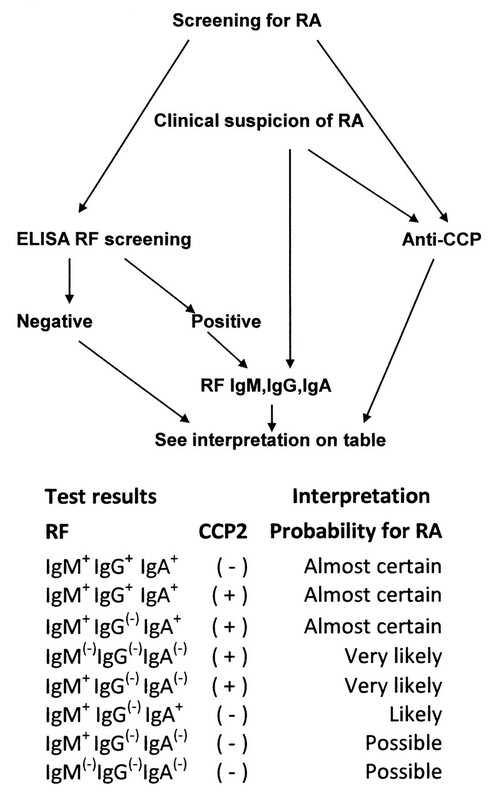 Proposed algorithm for the use of RF ELISA and anti-CCP tests in the diagnosis of RA. The reason for variable presence of RF isotyes in addition to IgM has not been clarified, but may have consequences for response to therapy35. There is probably an overlap between natural and pathological IgM RF in the individual as well as in the population. Since the prevalence of IgA and IgG RF in the RA population is lower than that of IgM RF, the isotype switch does not always occur, for unknown reasons. B cell depletion therapy in RA is accompanied by a drop in RF as well as in anti-CCP levels, and relapse is usually preceded by a rise of RF levels. However, the repopulation occurs with higher number of memory B cells, supporting the theory that RF is produced by clonally selected B cells36. RF is present in healthy people as part of the natural autoantibody repertoire, and is mainly produced by CD5+ B-1 cells. The genes for these autoantibodies can provide a template for the emergence of high affinity, somatically mutated, class-switched IgG and/or IgA autoantibodies37. Indeed, research has also found evidence of antigen-driven clonal selection and somatic hypermutation resulting in the production of high-affinity RF IgM38. Accepted for publication March 2, 2010.
. Clinical value of rheumatoid factor measurement. In: Teodorescu M, Froelich CJ, editors. Advanced immunoassays in rheumatology. Boca Raton: CRC Press; 1994:61–76.
. Rheumatoid factor revisited. Curr Opin Rheumatol 2004 May;16(3):246–53.
. Rheumatoid factor. In: Kelley W, Harris E, Ruddy S, Sledge E, editors. Textbook of rheumatology. 2nd ed. New York: Wilkins; 1985:665–79.
. The rheumatoid factor: an analysis of clinical utility. Am J Med 1991;91:528–34.
. Routine measurement of IgM, IgG, and IgA rheumatoid factors: high sensitivity, specificity and predictive value for rheumatoid arthritis. J Rheumatol 1997;24:1037–44.
. Measurement of rheumatoid factors by an enzyme-linked immunosorbent assay (ELISA) and comparison with other methods. Ann Rheum Dis 1985;44:13–9.
. Clinical significance of RF isotypes in seropositive arthritis. Rheumatol Int 1992;12:111–3.
. Combined elevation of IgM and IgA rheumatoid factor has high diagnostic specificity for rheumatoid arthritis. Rheumatol Int 1998;18:119–22.
. A prospective study on the incidence of rheumatoid arthritis among people with persistent increase of rheumatoid factor. Ann Rheum Dis 2000;59:149–51.
. IgG rheumatoid factor. Relationship to seropositive rheumatoid arthritis and absence in seronegative disorders. Arthritis Rheum 1979;22:988–98. Detection of antibodies to deiminated recombinant rat filaggrin by enzyme-linked immunosorbent assay: a highly effective test for the diagnosis of rheumatoid arthritis. Arthritis Rheum 2002;46:2051–8. Rheumatoid arthritis specific anti-Sa antibodies target citrullinated vimentin. Arthritis Res Ther 2004;6:R142–50. Diagnostic value of anti-human citrullinated fibrinogen ELISA and comparison with four other anti-citrullinated protein assays. Arthritis Res Ther 2006;8:R122.
. Diagnostic and predictive value of anti-cyclic citrullinated protein antibodies in rheumatoid arthritis: a systematic literature review. Ann Rheum Dis 2006;65:845–51. Anti-citrullinated protein/peptide antibodies (ACPA) in rheumatoid arthritis: specificity and relation with rheumatoid factor. Autoimmun Rev 2005;4:468–74.
. Diagnostic value of anti-cyclic citrullinated peptide antibodies to detect rheumatoid arthritis in patients with Sjogren’s syndrome. Ann Rheum Dis 2005;64:160–2. Role of anti-cyclic citrullinated peptide antibodies in discriminating patients with rheumatoid arthritis from patients with chronic hepatitis C infection-associated polyarticular involvement. Arthritis Res Ther 2004;6:R137–41.
. Absence of antibodies to cyclic citrullinated peptide in sera of patients with hepatitis C virus infection and cryoglobulinemia. Arthritis Rheum 2004;50:2305–8.
. Diagnostic and clinical value of anti-cyclic citrullinated peptide antibodies compared with rheumatoid factor isotypes in rheumatoid arthritis. Ann Rheum Dis 2004;63:1079–84.
. Technical and diagnostic performance of 6 assays for the measurement of citrullinated protein/peptide antibodies in the diagnosis of rheumatoid arthritis. Clin Chem 2007;53:498–504.
. Diagnostic usefulness of a third-generation anti-cyclic citrulline antibody test in patients with recent-onset polyarthritis. Clin Chem Lab Med 2007;45:1396–401. A comparison of the frequency of antibodies to cyclic citrullinated peptides using a third generation anti-CCP assay (CCP3) in systemic sclerosis, primary biliary cirrhosis and rheumatoid arthritis. Clin Rheumatol 2008;27:77–83. Impact of initial aggressive drug treatment with a combination of disease-modifying antirheumatic drugs on the development of work disability in early rheumatoid arthritis: a five-year randomized followup trial. Arthritis Rheum 2004; 50:55–62. Predictive value of antibodies to cyclic citrullinated peptide in patients with very early inflammatory arthritis. J Rheumatol 2005;32:231–8. The American Rheumatism Association 1987 revised criteria for the classification of rheumatoid arthritis. Arthritis Rheum 1988;31:315–24.
. Updating the American College of Rheumatology revised criteria for the classification of systemic lupus erythematosus. Arthritis Rheum 1997;40:1725.
. Information on diagnosis and management of systemic lupus erythematosus derived from the routine measurement of 8 nuclear autoantibodies. J Rheumatol 2003;30:1761–9.
. Quantitative detection of class-specific rheumatoid factors using mouse monoclonal antibodies and the biotin/streptavidin enhancement system. Br J Rheumatol 1989;28:310–6.
. Diagnostic and prognostic characteristics of the enzyme linked immunosorbent rheumatoid factor assays in rheumatoid arthritis. Ann Rheum Dis 1996;55:157–61.
. Which Antigen to use in the detection of rheumatoid factors? Comparison of patients with rheumatoid arthritis and subjects with ‘false positive’ rheumatoid factor reactions. Clin Exp Immunol 1989;77:349–55. Autoantibodies to cyclic citrullinated peptides predict progression to rheumatoid arthritis in patients with undifferentiated arthritis: a prospective cohort study. Arthritis Rheum 2004;50:709–15. Specific autoantibodies precede the symptoms of rheumatoid arthritis: a study of serial measurements in blood donors. Arthritis Rheum 2004;50:380–6.
. Elevation of only one rheumatoid factor isotype is not associated with increased prevalence of rheumatoid arthritis—a population based study. Scand J Rheumatol 2000;29:190–1.
. Can we accurately predict the development of rheumatoid arthritis in the preclinical phase? Arthritis Rheum 2003;48:2701–5. High IgA rheumatoid factor levels are associated with poor clinical response to tumour necrosis factor alpha inhibitors in rheumatoid arthritis. Ann Rheum Dis 2007;66:302–7.
. Reconstitution of peripheral blood B cells after depletion with rituximab in patients with rheumatoid arthritis. Arthritis Rheum 2006;54:613–20.
. Nature and functions of autoantibodies. Nat Clin Pract Rheumatol 2008;4:491–8.
. Human rheumatoid B-1a (CD5+ B) cells make somatically hypermutated high affinity IgM rheumatoid factors. J Immunol 1993;151:473–88.